The following Postal Service guidelines apply to the installation of a rural style mailbox on a post in front of your home. Posts should be 4 x 4 inch wood posts or a two (2) inch, thin wall steel pipe. Posts that are more substantial in construction are considered “deadly fixed objects” and are not permitted within the Township R.O.W. such as railroad ties, mailboxes in brick piers, I-beams, etc. The bottom of the mailbox should be forty (40) inches above the ground. The front of the mailbox should be eight (8) inches in from the back of the curb or edge of the road or shoulder. 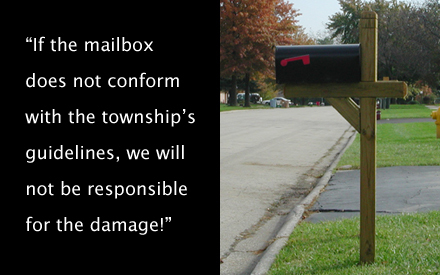 If the mailbox does not conform to the above guidelines, the Township will not be held responsible. If installed properly and the mailbox is damaged by Township equipment when snow plowing, we will replace it with a “standard” 4 x 4 wood post and support. Mailbox replacement is the standard box, model 1C. If the post is damaged, it will be repaired temporarily and replaced in the Spring or Summer. Not all mailbox damage is from the Township equipment. Old, rotted, rusted through posts, or vandalized boxes are not the Township’s responsibility. 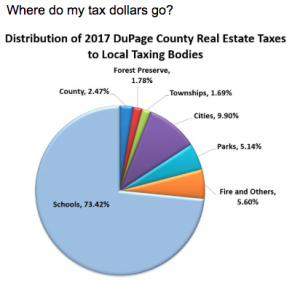 Your participation and cooperation in complying with the above will be greatly appreciated by your postal carrier, postal service and Downers Grove Township Highway Department.